Clay mask from Teotihuacan 1B.C - 900 A.D.
Mexico in the Classic period ( 200 B.C. - 900 A.D.) there were three dominate cultures: Teotihuacan, Monte Albain and the Maya .The most important was the huge complex of Teotihuacan ' The place of the Gods ' as it was called by the Aztecs , who believed that it was built by a race of giants .It is located 30 miles from Mexico City .The city measured over 12 square miles, in the core of which was a ceremonial center occupying 2 square miles .The city was one of the largest in the world at the time, with a population estimated to be 200,000 and was held in awe by following cultures .At its height between 150 and 450 AD , Teotihuacan controlled an area from northern Mexico to Guatemala . For all their greatness, its rulers remain anonymous, nowhere have their portraits been discovered and no writings have been found inscribed in their great city .Perhaps their written records were made on bark. Because of the lack of written records, the language and ethnic identity of the Teotihuacans is unknown . Mystery of Teotihuacan - Pyramids Mexico "The Birthplace Of Gods"
The name Teotihuacan ("Birthplace Of The Gods") was given by Aztecs centuries AFTER the fall of the city. 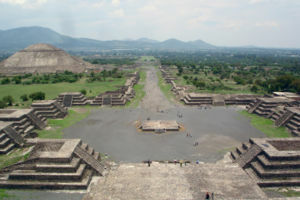 At its zenith in the first half of the 1st millennium CE, Teotihuacan was the largest city in the pre-Columbian Americas. At this time it may have had more than 100,000 inhabitants, placing it among the largest cities of the world in this period. 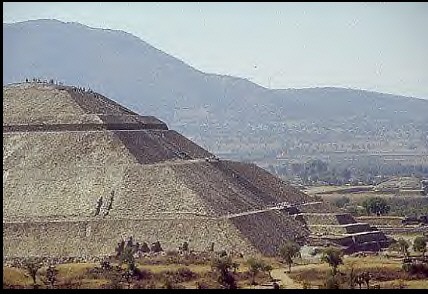 The civilization and cultural complex associated with the site is also referred to as Teotihuacan or Teotihuacano. 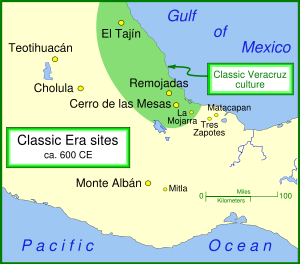 Although it is a subject of debate whether Teotihuacan was the center of a state empire, its influence throughout Mesoamerica is well documented; evidence of Teotihuacano presence, if not outright political and economic control, can be seen at numerous sites in Veracruz and the Maya region. 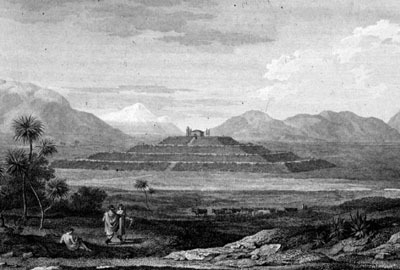 The ethnicity of the inhabitants of Teotihuacan is also a subject of debate. Possible candidates are the Nahua, Otomi or Totonac ethnic groups. Scholars have also suggested that Teotihuacan was a multiethnic state. 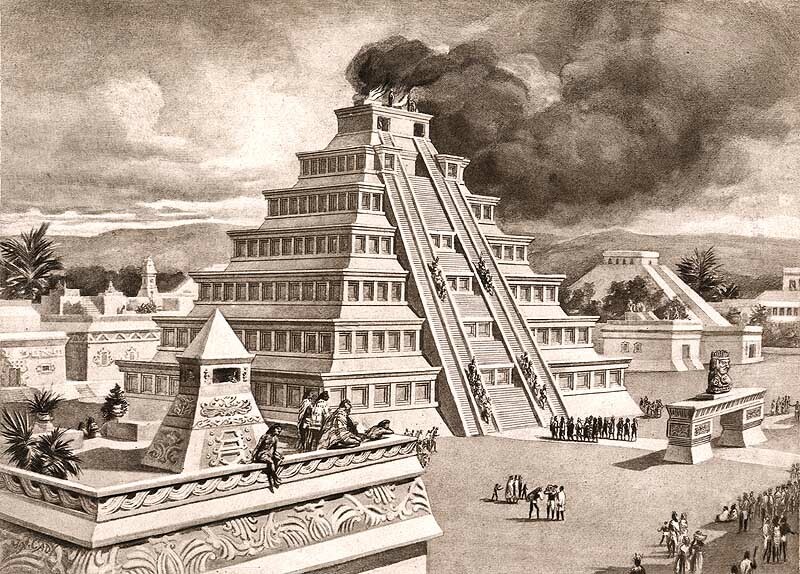 The early history of the people who built Teotihuacan is obscure, but by 200 B.C. they emerged as the main culture in the Valley of Mexico .Their carefully planned city was laid out on a grid scale .The main thoroughfare, the " Avenue of the Dead' was 150 feet wide and went through the heart of the city .The Aztecs believed they were tombs, inspiring the name of the avenue. Now they are known to be ceremonial platforms that were topped with temples. Following a team of international scientists, this film exclusively documents an archeological sensation: the exploration of royal tombs beneath the ancient Mexican city of Teotihuac�n. Despite many decades of research, not much is known about the long-lost Teotihuac�n society. But when archeologists enter the newly discovered burial chambers, they find the clues that may finally tell us who these mysterious people were. The most famous monument is the Pyramid of the Sun, which rises to a height of 215 feet .It was constructed around 150 A.D.It held a temple on top . A sacred cave has been located beneath the Pyramid of the Sun, which may have some relation to the Mesoamerican belief about the creation of the world .The Pyramid of the Sun covers about the same area as the Great Pyramid in Egypt, but only half its height . The population of the surrounding countryside, were probably coerced into living in the city . The common people lived in huge apartment complexes for 60 to 100 people with open, common courtyards . Teotihuacan temple for the plumed serpent Quetzalcoatal (the dragon looking creature is Quetzalcoatal) next to it is Tlaloc . Click here for a larger picture . 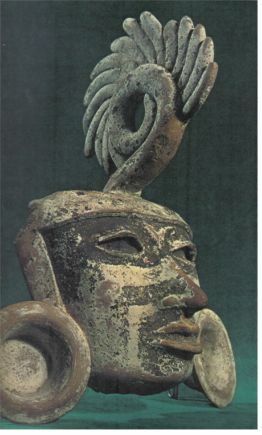 The main god was Quetzalcoatl, the feathered serpent . 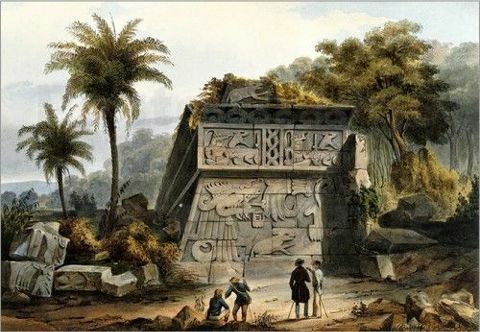 The city God has been called the Great goddess, from whose yellow hands flowed streams of shells and jade , perhaps symbols of fertility and wealth By about 650 A.D. its powered weakened, possible due to agricultural or climatic reasons and the city was sacked by its enemies and was almost completely abandoned around 750 AD..The earliest buildings at Teotihuacan date to about 200 BC, and the largest pyramid, the Pyramid of the Sun, was completed by 100 AD. Is there Pre-Columbian Writing at Teotihuacan? 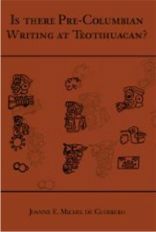 This book discusses whether symbols at Teotihuacan are a writing system or not. A mural called the Paradise of Tlaloc ( the water god ), one of the first murals in Mexico . The city was a center of industry, home to many potters, jewelers and craftsmen. Teotihuacan is known for producing a great number of obsidian artifacts. Unfortunately no ancient Teotihuacano non-ideographic texts are known to exist (or known to have existed), but mentions of the city in inscriptions from Maya cities show that Teotihuacan nobility traveled to and perhaps conquered local rulers as far away as Honduras. Maya inscriptions mention an individual nicknamed by scholars as "Spear thrower Owl", apparently ruler of Teotihuacan, who reigned for over 60 years and installed his relatives as rulers of Tikal and Uaxactun in Guatemala. When Teotihuacan collapsed, three cities in central Mexico remained, these were Cholula,a holy city in the state of Puebla , Xochicalco in Morelos and El Tajin in Veracruz . They were probably client states of Teotihuacan Cholula thus remained a regional center of importance, The center of Cholula was dominated by a huge pyramid, the largest in the world . It was dedicated to Quetzalcoatl . In total volume, it was greater than the Pyramid of Cheops . Cholula, just outside the city of Puebla, is the site of the massive Cholula pyramid (The Great Pyramid of Cholula). In the days before the Spanish conquest, Cholula was a sacred city, and also a major commercial centre. When Hernan Cortes saw it, he declared it to be the most beautiful city outside of Spain itself. The area has probably been inhabited for over 3000 years, and the original pyramid may be over 2000 years old. Up to the time of the fall of the Aztec empire, Aztec princes were still formally anointed by a Cholulan priest in a manner reminiscent, and perhaps even analogous, to the way some Mayan princes appear to have come to Teotihuacan in search of some sort of formalization of their rulership. At the time of the arrival of Hernan Cortes Cholula was second only to the Aztec capital Tenochtitlan (modern Mexico City) as the largest city in central Mexico, possibly with a population of up to 100,000 people. 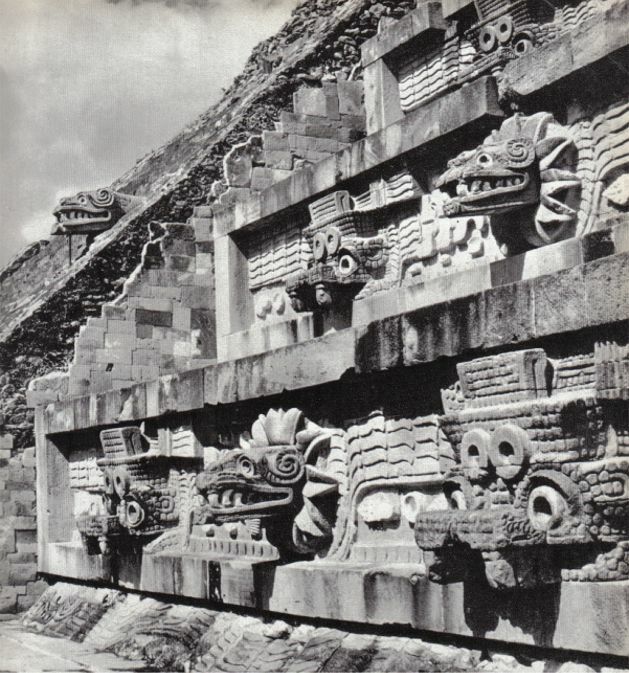 In addition to the great temple of Quetzalcoatl and various palaces, the city had 365 temples. To view a larger image click here . Xochicalco was first built around 200 B.C. and shows influences of Teotihuacan and the Maya .Unlike Teotihuacan, it was fortified with moats and parapets, maybe due to Olmec attacks .Most of its notable architecture built between about 700 and 1000 AD. At its peak, the city may have had a population of up to 20,000 people. Xochicalco, Morelos, Mexico. A fascinating pre-Columbian city with an explanation of the seemingly bizarre 260 day "Maya" calendar. El Tajin as it appeared in its heyday . Click here for a larger picture . El Tajin had much influence on the Gulf coast, after the fall of Teotihuacan, it was the most powerful of the three large urban areas .The famous pyramid, seen above has a niche for each day of the year .Construction in El Tajin continued to about the start of the 13th century, at which time, according to tradition, the city was conquered and burned by Chichimec invaders. El Taj�n is a pre-Columbian archeological site and one of the largest and most important cities of the Classic era of Mesoamerica. A part of the Classic Veracruz culture. The archeological site is known by the local Totonacs, whose ancestors may also have built the city, as El Taj�n, which was said to mean "of thunder or lightning bolt". Related to this is their belief that twelve old thunderstorm deities, known as Taj�n, still inhabit the ruins. El Taj�n was inscribed as a World Heritage Site in 1992 . The 'Pyramid of the Niches', a masterpiece of ancient Mexican and American architecture, reveals the astronomical and symbolic significance of the buildings." A replica of the temple can be seen at the end of the movie From Dusk till Dawn by Quentin Tarantino .The site is one of the most important in Mexico and the most important in the state of Veracruz.The Totonac people resided in the eastern coastal and mountainous regions of Mexico at the time of the Spanish arrival in 1519. Today they reside in the states of Veracruz, Puebla, and Hidalgo. They are one of the possible builders of the Pre-Columbian city of El Taj�n, and further maintained quarters in Teotihuac�n. The ball game, ollama, was extremely important to the meso-Americans of this region and all the major centers had one or more ball courts. The length of the court could vary, on a wall was a stone ring into one tried to knock a eight inch rubber ball through without using ones hands .Some games had religious significance, with the losing team being sacrificed.